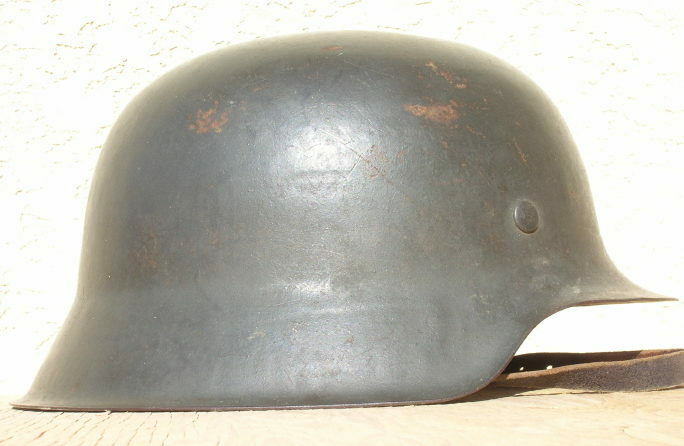 The German helmet of World War II is often broken down for distinction in three different models. The M35, M40 and M42. In truth according to the German high command there was only one model, the Model 35, so called because the first years of production was in 1935. The other models, the M40 and M42 do not exist in German military records. The reason for this is simply because the German military did not consider the later two versions to be new models, just modifications of the original design. The reasons for these modification were the result of a massively expanding war that required helmets as quickly as the factories could turn them out. The German military had been experiencing helmet shortage since the 1930s. Part of this was due to the decision to sell over 220,000 brand newly produced M35 helmets to the Nationalist Chinese government between 1935 and 1937, not to mention smaller numbers of helmets being sent to Spain and Finland. The shortage was also due to the fact that the Germany military was going though massive growth during the same time frame. 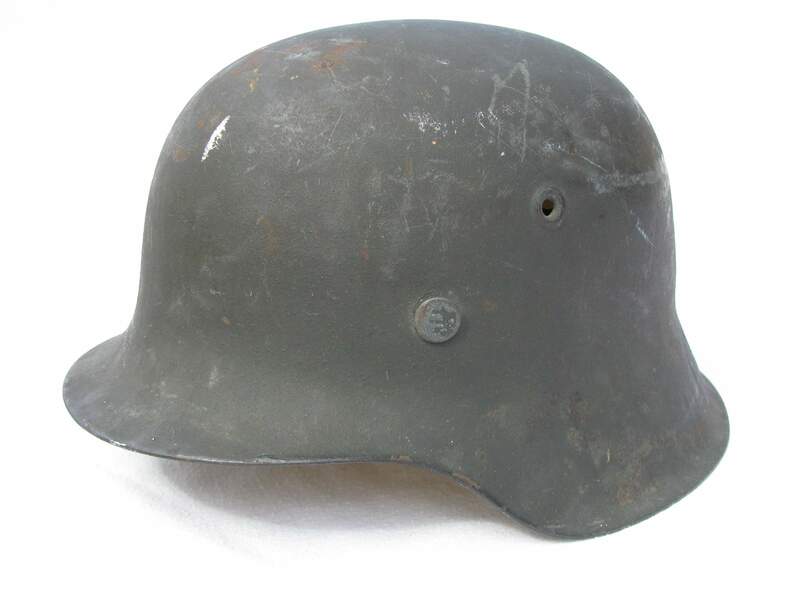 In addition on February 2nd of 1940 the German military ordered that all German armored troops be issued helmets, where as before that date they were not issued one. The first modification which was intended to speed production up would take place in 26 March 1940. The air vents on both sides of the helmet would be embossed into the steel instead of being a separate piece peened into place. The steel would change as well to heavier manganese-silicon steel. The prior to used Molybdenum steel would no longer be used as 90% of the worlds molybdenite needed to manufacture the steel was in the U.S.A. and South America and was becoming unavailable for German purchase. While the embossed air vents would allow for faster helmet production it would not suffice for long. With the Invasion of the Soviet Union in June of 1941, not to mention campaigns in North Africa and the Balkans more helmets were going to be needed quickly. The final modification was ordered by the German high command on 6 June 1942. As an economic measure the helmet’s rolled edge would be discontinued in favor of a raw edge. The method of manufacture would change as well. The original method of slow press forming in combination with over-heated tempering which had to be done in multiply steps was changed to a rapid hot-stamping method which could produced the helmet in four short steps. While the new heat stamping method would allow for a faster production of helmets it did have it’s draw backs. 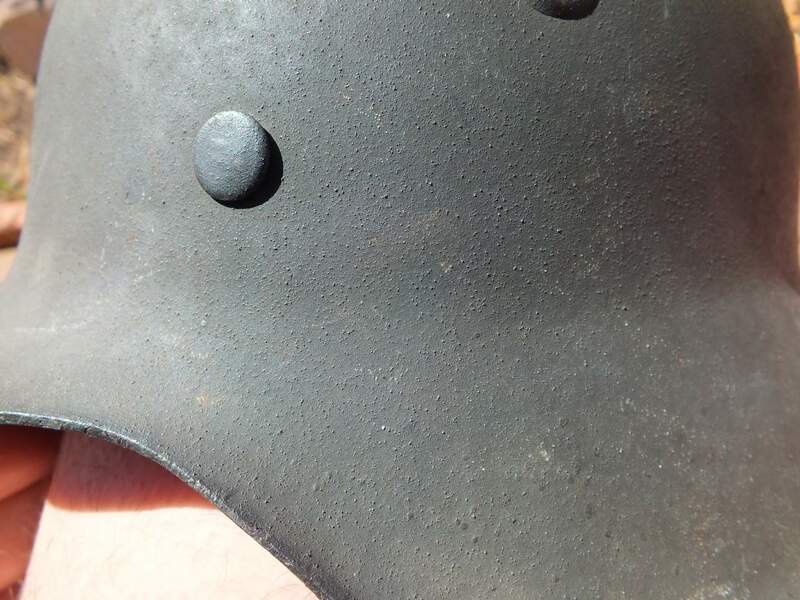 Due to the rapid production method the skirts of these helmets are often found with rippled stress marks. 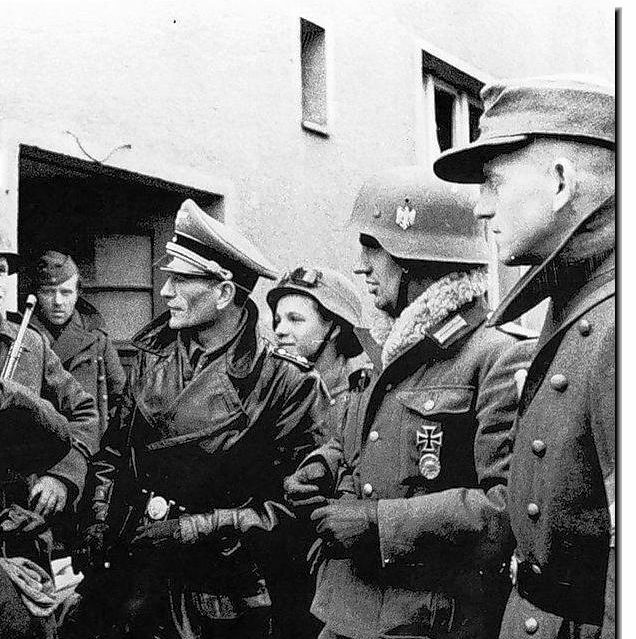 By the time the M42 helmet was in full production the German military was experiencing set backs across every front. 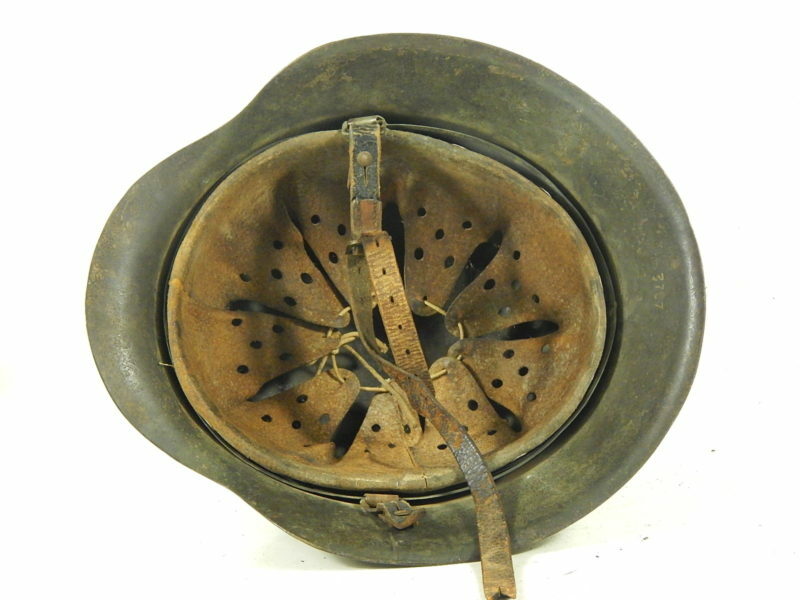 The need for helmets continued to expand however, therefore manufactured helmets which might not have been considered acceptable in prior years were sent to the front. Due to this fact M42 helmet were frequently made from poorer quality steel than their predecessors. 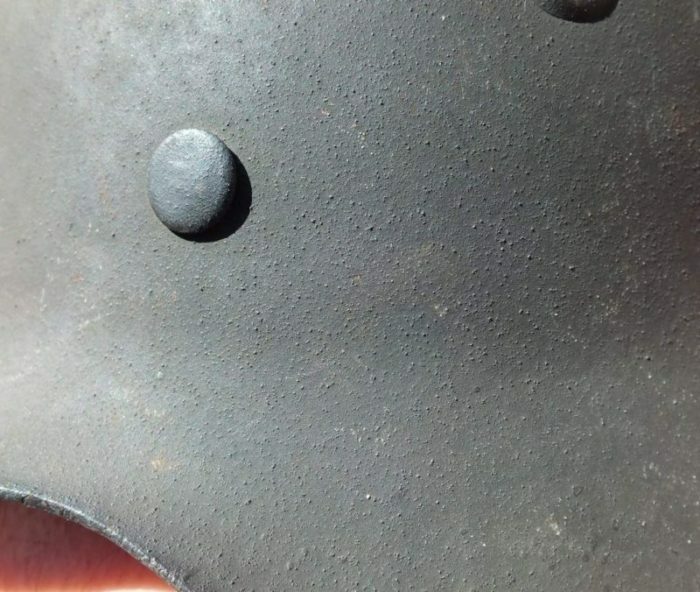 M35 and M40 helmets almost always exhibit smooth steel free blemishes. M42s however are often encountered with rough seemingly unfinished steel. These blemishes are caused by impurities in the steel, in years past these impurities were removed during the refining process. 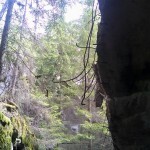 This was both an added cost and aside it slowed the manufacture process down. Thus the extra steps necessary to produce finer steel for helmets was abandoned. Although M42s from all the five known helmet manufactures show signs of lesser quality than the earlier models, there are two firms which are more frequently found with quality issues. 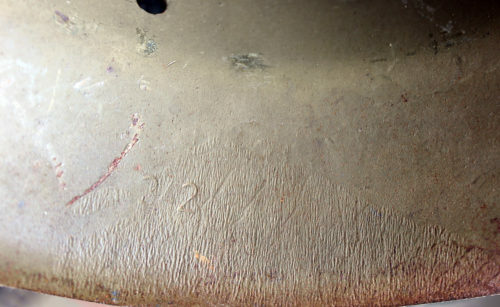 M42 helmets from Emaillerwerke AG, Fulda and Vereinigte Deutsche Nickelwerke AG, Schwerte are often found with badly rippled skirts, misaligned vents, inferior paint finishes, and crudely stamped or missing heating lot numbers and factory stamps. This maybe due to the use of slave labor by both of these factories. Surviving records show Vereinigte Deutsche Nickelwerke AG, Schwerte utilized both French POWs as well as Russian women forcible removed from the occupied parts of the Soviet Union as slave labor. Emaillerwerke AG, Fulda used both Russian men and women drawn from a near by slave labor camp. Not surprising most of these men and women had poor training, few had any background in metal work, and naturally had little true motivation to produce a quality product. 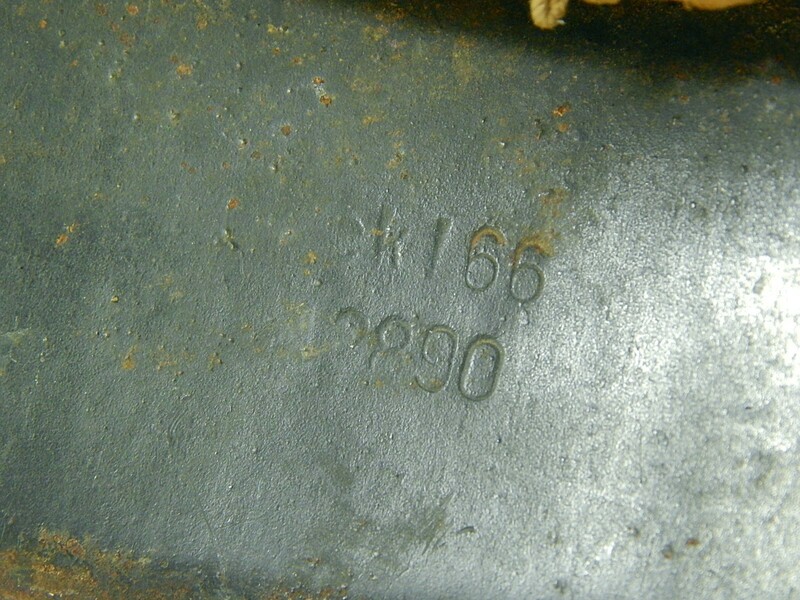 Like the M42 predecessors, in theory all helmets were stamped with a manufacture mark and a heating lot number as was required by the German government. 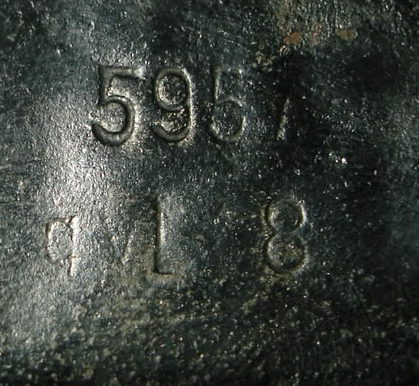 The lot number was stamped on the back of the inside of the helmet’s skirt while the factory marking was stamped on the inside of the left side of the skirt. Early production M42 are marked in exactly this manor, however around February of 1943 both factory and lot number would be both stamped on the back inside of the helmet’s skirt. This was in all likelihood done to save time. Two of the helmet manufactures would also change their previously used factory marks. 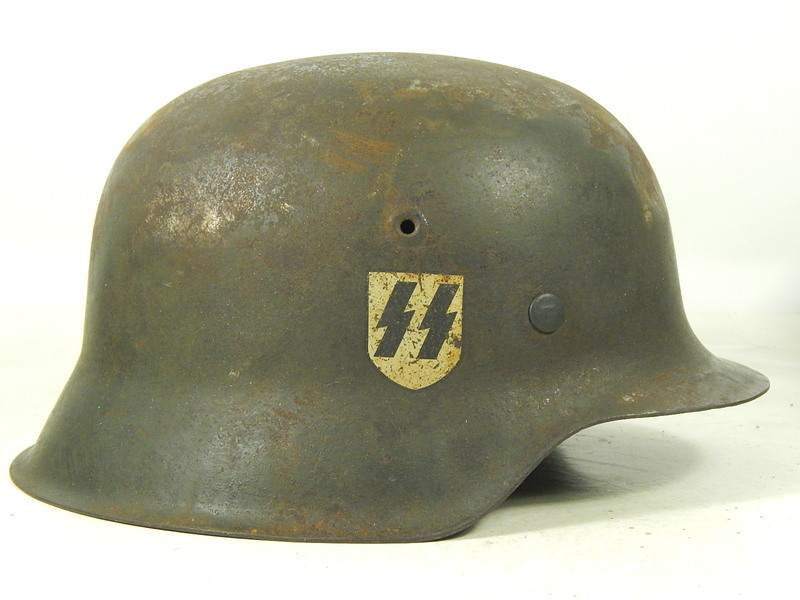 Starting in mid 1941 Sachsishe Emaillerwerke, Lauter modified the markings they used on their helmets from SE to Hkp. 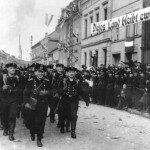 In February of 1943 Eisenhüttenwerk AG, Thale Hartzuttenwerk AG, Thale Harz would change their makings from a simple ET to Ckl and finally to a CKL in early 1944. The change was done at a time when the German government was attempting to conceal the names and cities of military contractors, in order to make it harder for the allies to locate and thus bomb military manufacturing centers. Despite this of the five known factories only the two are known to have modified their markings. The painted surface on M42 helmets are similar to their M40 predecessor, which had been standardized since March of 1940. There are however some differences. 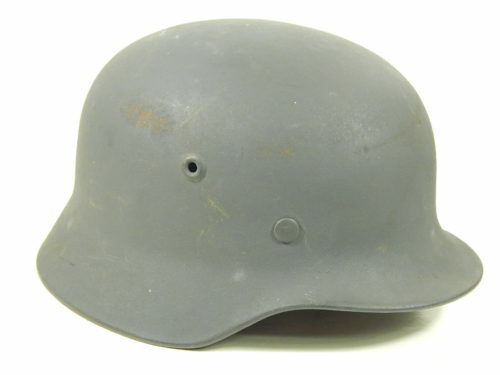 M42 Helmets were painted matte slate gray or blue-gray for the Luftwaffe. Various shades of these colors are observed. Later production M42s especially from Eisenhuttenwerke are often found with very thin paint often of a much darker shade of slate gray, this was certainly a war-time economy measure. Early in the production of M42 helmets a large number of blue-gray Luftwaffe helmets were made. During this period Hitler was authorized the creation of Luftwaffe Infantry units so the need for helmets painted specifically for the Luftwaffe increased. The numbers of blue-gray painted Luftwaffe M42s however fall significantly by late 1943. 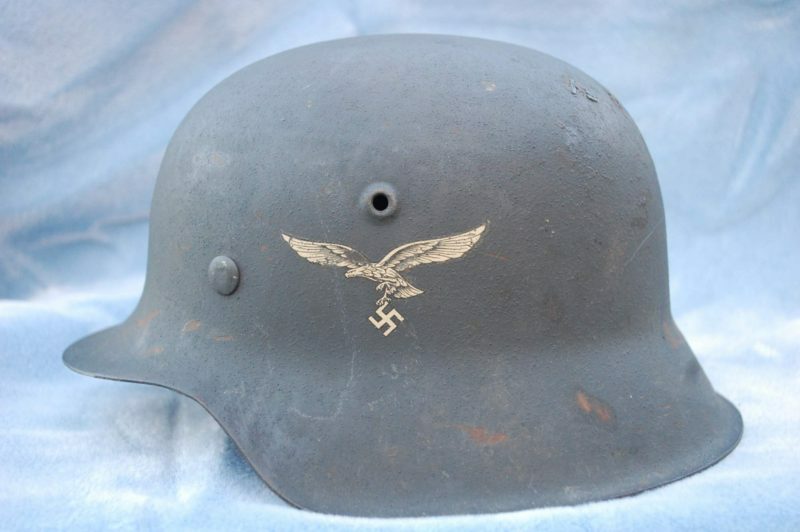 Few original blue-gray Luftwaffe helmets are found produced after the summer of 1943. A number of theories are put forward as to why. The most creatable of these is the use of blue-gray paint necessitated a separate production line, which was costly and time consuming. 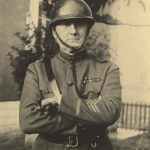 It was thus easier to standardize to slate-gray and send all branches of the Germany military helmets painted the same color. The paint was textured with aluminum oxide powder to create an anti-reflective finish. The coarseness of the aluminum oxide does vary from factory to factory. 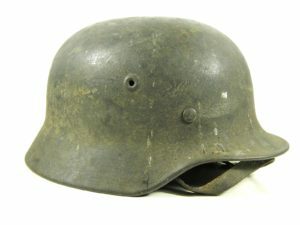 M42 helmets produced by Sachsishe Emaillerwerke, Lauter often feature a particular rough aluminum oxide finish. Some M42s are encountered with very light aluminum textured finishes or in some cases fine saw dust was used as a substitute. This is probably due to a shortage of aluminum oxide caused by the war and factories made do with what was available to them. M42 helmets utilized the same liner and chinstrap system as the M40. The liner consisted of two interlocking zinc alloy bands held into the helmet with three split pins. 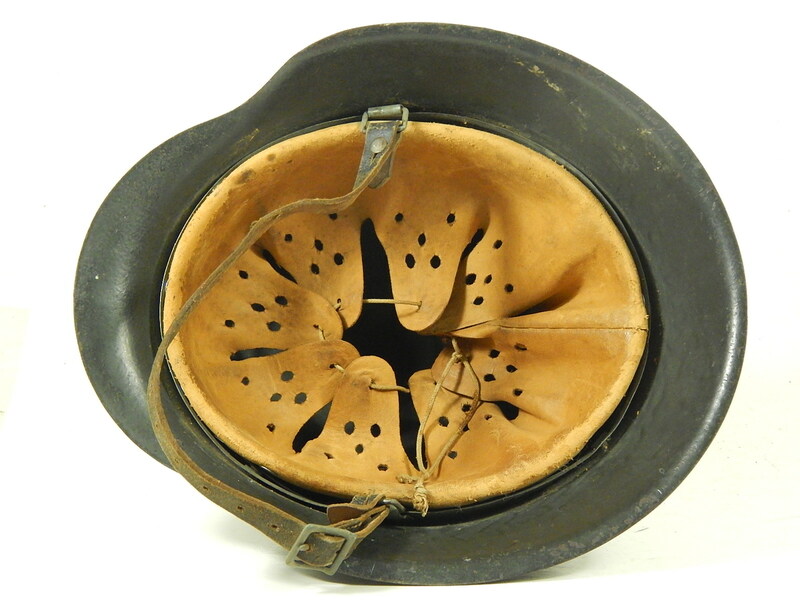 While liners from the early part of the war typically used steer hide, or sheep skin, later in the war these higher quality leather were exchanged for much cheaper pig skin. 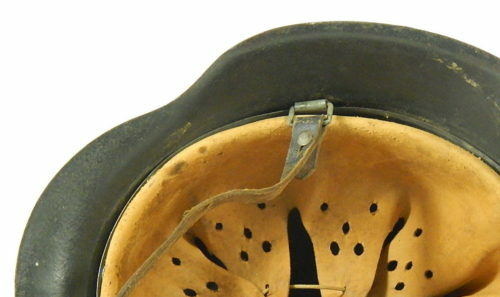 Although the helmet’s chinstrap remained almost unchanged from 1935 on, by the time the M42 came into production the markings on the strap did. 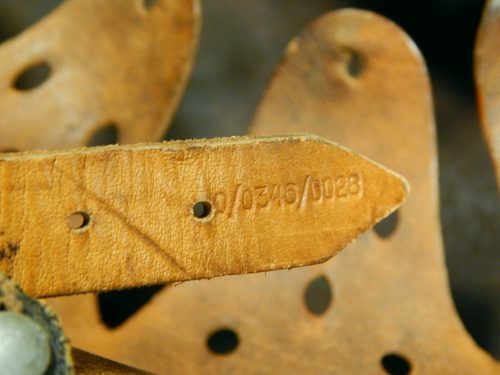 Prior to 1943 chinstrap were marked with a manufacture name and year of production. Starting in 1943 the manufacture was substituted for a code known as a Reichsbetriebsnummer or RB number. These numbers were used on all sorts of German equipment, uniforms and field gear not just chinstraps. The code was tied to a specific manufacture for quality control proposes. The use of the code was done to confuse allied intelligence from knowing the location of military equipment manufactures. No discussion of M42 helmets can be complete without touching on the use of decals. The German military had been using decals to designate the branch of service since 1935. 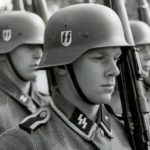 When the M42 helmet went into production in June of 1942 the branch of service decal for the Heer, Luftwaffe, Kreigsmarine, and SS were still being applied to one side of the helmet. The wearer’s left for Heer, Luftwaffe, Kreigsmarine, the right for the SS. German combat Police helmets were issued with a Police decal on the wearer’s left and a Nazi party shield on the right. Starting on 28 Augusts of 1943 and order was issued to the helmet factories that decals for the Heer, Luftwaffe, Kreigsmarine were no longer be applied. 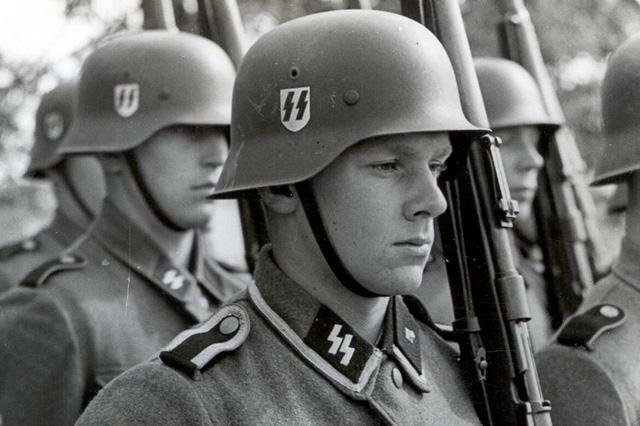 SS decals would continue to be applied at the factory level until another order was issued on 1 November 1943 requiring that the practice stop. Oddly an order was never issued for Police helmets, and the factories would continue to apply the Police decals until the end of the war, but it seems in smaller number. Photos often show Police units wearing helmets without decals. The reason for the decal drop is often theorized as to make the helmet less conspicuous. There is no real evidence for this. The order was given to the factories not to the men in the field. 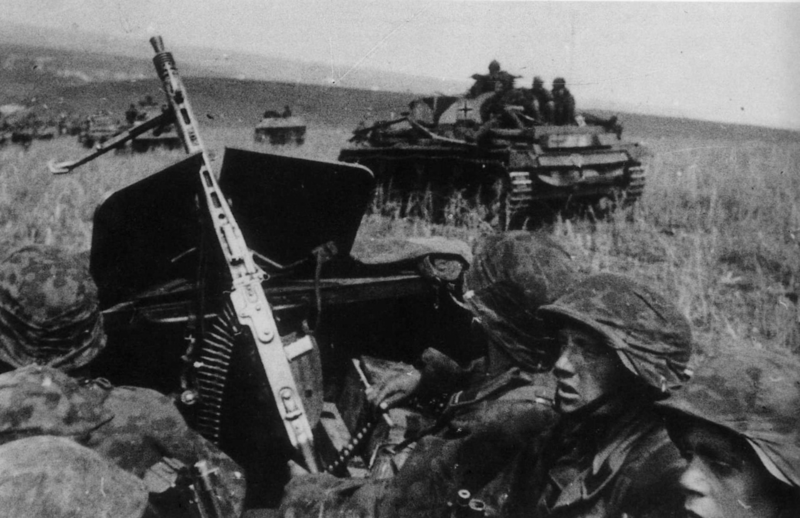 Photos taken of German soldiers well into 1945 show the prominent use of decals. There does not appear to be any wide spread decal removal by German soldiers in the field after the orders were issued. In fact many helmets are discover with camouflage patterns carefully painted around the decals, instead of painting them over. The real reason the decals were dropped is likely for the exact same reason that Luftwaffe blue-gray painted helmet production ceased. The application of decals for five different branches of service was both costly and time consuming. With the war going badly the use of decals was no longer a luxury that could be afforded. By late 1944 a plane slate gray helmet would be issued to all branches of the service till the end of the war. 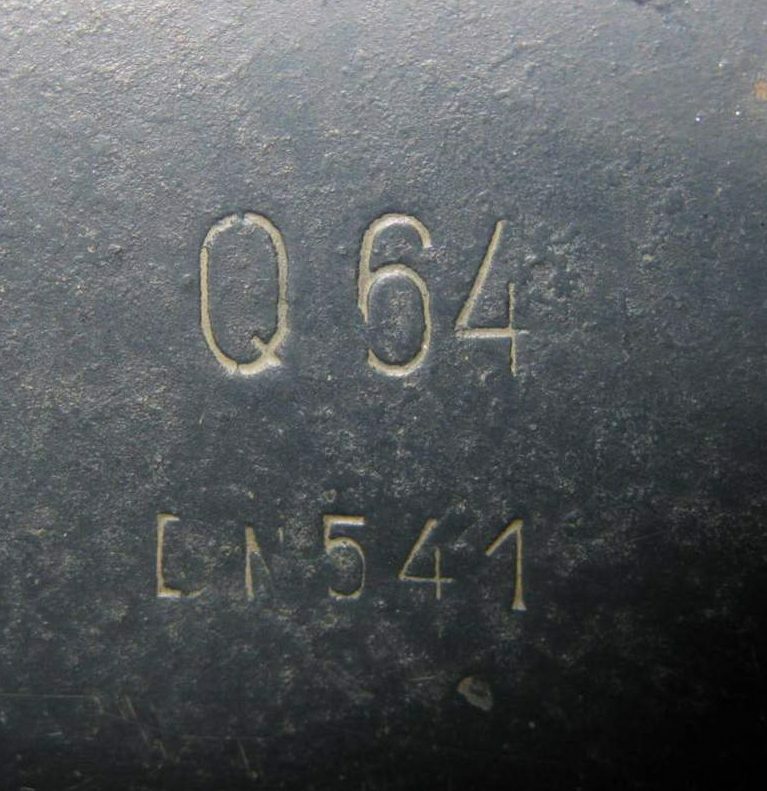 A number of M42 helmets have been discovered with the manufacture marks of qvL, bvl, and bvL. At this date these is no conclusive evidence as to which firm made these helmets. It appears that these three different marks are all from the same maker. It maybe that the b is actually an upside down q. Complicating matters a few of these helmets are found missing the first letter all together. This may just be a factory error. Original helmets with these markings are found to be painted rough textured slate gray and lack decals. These would seem to indicate they were made after the decal drop order of 28 August 1943. 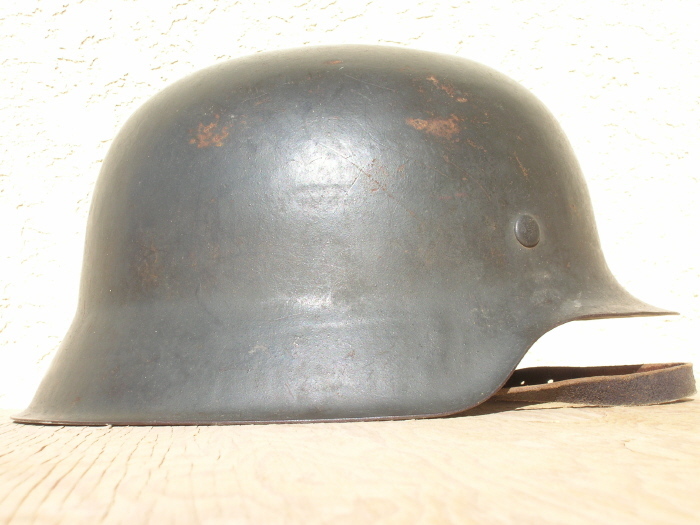 The helmet’s components are typical dated 1943 or 44 which further confirms late 1943-44 production. 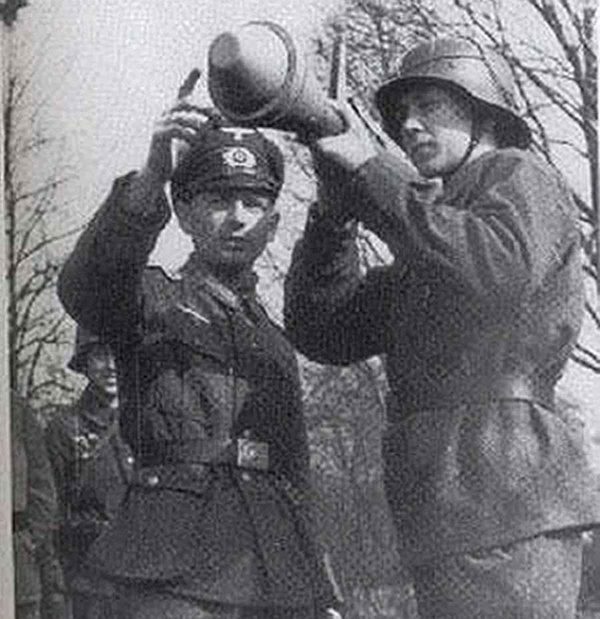 When the directive came down from the German high command to no longer roll the helmet rim one firm did not comply. For reasons that are still not clear F.W. Quist G.m.b.H., Esslingen did not heed the order, and continued to produce M40 helmets, right into 1945. Quist appears to have gotten some push back about their refusal to produce the raw-rimmed M42 and documents have surfaced that in mid 1944 Quist was again directed by German high command to produce raw rimmed helmets. This they did, but in very small numbers. Heating lot numbers found on original M42s from this factory indicate production started on these helmets in mid-1944 likely right after Quist received the second directive. Still it appears that Quist showed no real desire to mass produce M42 helmets and very few have been found today. As of the writing of this piece those Quist marked M42 that have turned up are only found in size 64. It would seem to indicate that in order to placate the directive Quist dedication only one production line to making M42. The rest of their production would continue to make M40s. As to date no documentation has surfaced as to why Quist delayed following the directive. One theory that has been put forward is that Quist was proud of the high quality M40 they manufactured. Quist M40s are made from slightly thicker steel than helmets made by the other firms. The design show a high degree of craftsmanship with smooth flowing lines and flawlessly rolled rims. Helmets from this firm are rarely found with any flaws. The M42 made by Quist also show a high degree of craftsmenship, and do not exhibit the same flaws seen on M42s produced by other factories. The Quist M42s were made in the same fashion that M35s were made before the war. Instead of the rapid hot-stamping method which produced the helmet in four short steps. The original method of slow press forming in combination with over-heated tempering which had to be done in multiply steps was used. Although time consuming this method assured the helmet would be free of stress cracks, and ripples in the skirt and vison. It seems that Quist was determined to produce a quality helmets despite the lengthy process. A small number of M42s have been found that lack vents. In the days before much study had been done on heating lot numbers it had been assumed by many that these helmets represented a “last ditch” variation a desperate Germany resorted to in the last days of the Reich. This belief gave away to the M45 nomenclature often bestowed on these helmets by collectors and enthusiasts. The heating lot numbers on these helmets do not seem to conform to the belief that these helmets were made in the early months of 1945. In fact a study of the heating lots indicate mid to late 1944 production, which rules out the last-ditch aspect of these helmets. One theory is that these helmets were factory errors. However even that theory has flaws. 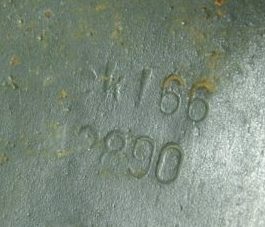 Vent-less M42s have been found bearing the factory stamps ckl, CKL, ET, hkp, and qvL, indicating these helmets were made by three different factories. It seems unlikely all three of these factories were making the exact same error. Another theory holds that these helmets represent a time frame when production was particularly hurried in these particular helmet factories and the last step of punching the vent holes was skipped to alleviate production bottlenecks. It also maybe is that these vent-less helmets were prototypes of a contemplated modification. Those that were made were then issued out for field trials. Yet the rarity of existing examples would indicate that whatever the true reason was it did not become a standard practice. A member of the Waffen-SS wearing his newly issued M42. As to fore mentioned the German high command did not distinguish between three variations of German helmets. All three variations would see service until the end of the war, but the M42 with almost three full years of mass production would be the most common helmet of the war. Still this does not mean that starting in June of 1942 that everyone got one of those helmets. Production lags and distribution time would have take weeks if not months and it is likely that M42s did not show up en masse until late 1942 if not 1943. Therefore few of these helmets made appearances during the major battle of 1942. It maybe possible that a few M42s did mange to make it to North African before the end of that campaign. If they were worn though it would have been near the end in Tunisia. Yet by mid 1943 original photos do start to show their usage in increasingly large numbers. In 1944 these helmets would have been common place. Late-war formed units would have mostly received M42s with maybe a few reconditioned M40s and M35s. 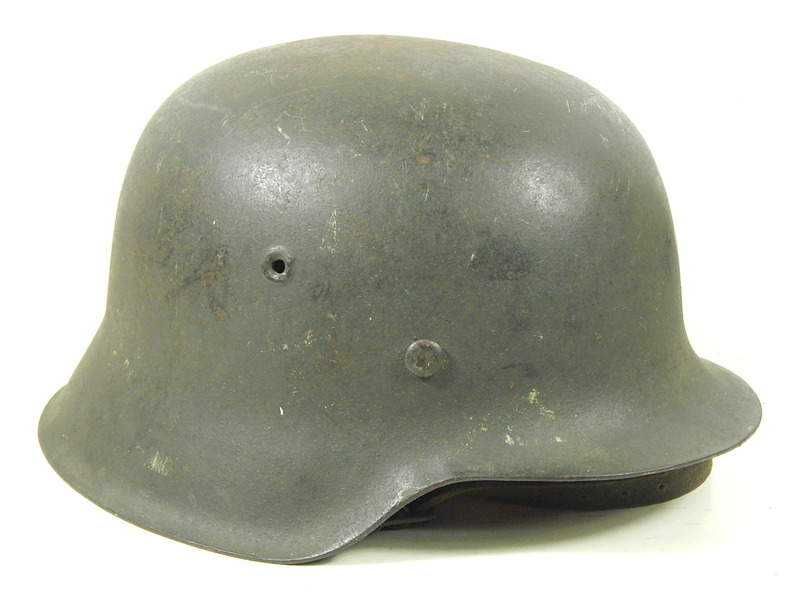 The M42 was the last generation of German combat steel helmets. The M42 ended an era that started in 1916 with the first German helmet. 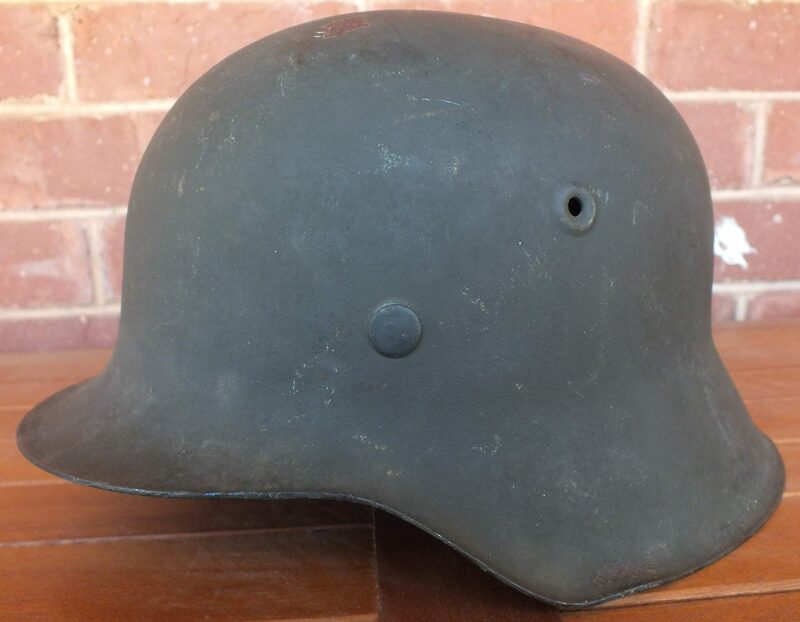 While the M42 with it’s simplified raw edge maybe not have been as flashy as it’s predecessors the helmet still did the trick, and protected German soldiers from Kursk to the fall of Berlin. 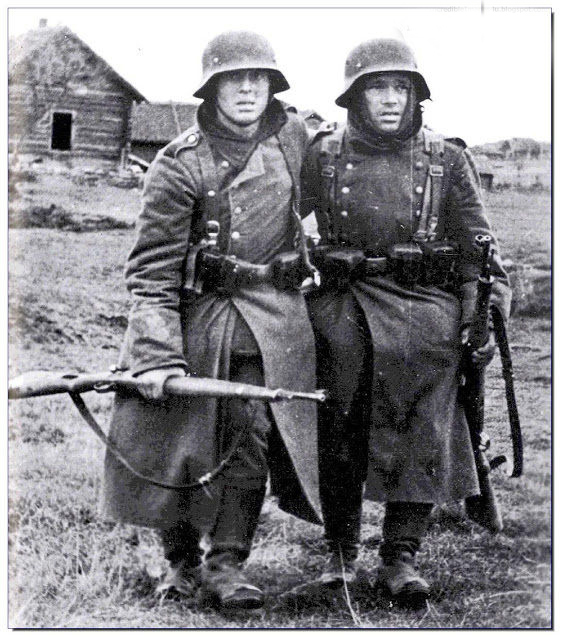 Photo taken late in the war of two German soldiers wearing M42 helmets.